Weighty Matters: Coca Cola Lies to Doctors? 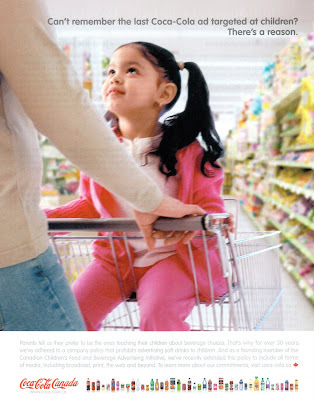 The ad pictured above appeared on page 1632 of the June 17th edition of the Canadian Medical Association Journal. "Can't remember the last Coca-Cola ad targeted at children? There's a reason"
"Parents tell us they prefer to be the ones teaching their children about beverage choices. That's why for over 50 years we've adhered to a company policy that prohibits advertising soft drinks to children." "And as a founding member of Canadian Children's Food and Beverage Advertising Initiative, we'vre recetnly extended this policy to include all forms of media, including broadcast, print, the web and beyond." Well I can remember boatloads of Coca-Cola advertisements targeting children. From the famous Mean Joe Green football jersey commercial, to Santa Claus, little stuffed vending machine animals, animated polar bears, video games and recording and sports idols. Thankfully, youtube remembers them as well and a smattering of them are posted down below (email subscribers, you'll have to actually visit the blog by clicking here as embedded videos don't make it into the email). Visiting the Coca-Cola company's website you'll find that there's a lot of small print attached to their pledge but basically it comes down to this - it only applies to programming that is specifically geared towards children under the age of 12. I suppose that means targeting children during any family friendly shows (American/Canadian Idol, sports, some prime time stuff) is fair game and I suppose it also means Coca-Cola thinks your 12 year old is an adult. What a beautiful example of how Big Food sponsored voluntary "regulation" through grandiose sounding endeavours such as the "Canadian Children's Food and Beverage Advertising Initiative" aren't worth the paper they're written on.